It’s been almost a month now, and that seems like a useful distance from which to reflect on my first conference experience. Also, like everyone I know, I have been juggling multiple roles and responsibilities and feel like I am just now getting “caught up” – whatever that means – with my academic life after giving it a ridiculous amount of attention in late May/early June and then having to ignore it while I got all my other ducks in a row. So now I’ve had some time to think over what I saw and heard and see what has stuck with me. It probably won’t have the accuracy that an immediate response would have had, but here goes. I had the incomparable Cindy Selfe at my table and might have said something like “I don’t believe in multimodal assessment! Students make things and share them with the class, and they don’t need me to put a letter on it for them to know whether it worked!” She -and everyone at my table – was very patient with me until my hysteria died down, and then they helped me think about some readings and approaches that might help me get at a better articulation of my concerns. I’m… still articulating them. Watch this space! I squeezed in just a few minutes late to the packed presentation room for B5 – PLZ RT: Networks, Performances, and Games on Twitter with John Jones, Cate Blouke and Michael Widner. I only caught the end of Jones’ presentation but was intrigued by his argument about how people use hashtags on twitter to communicate subtle messages and how even though the alliances through twitter hashtags may be temporary (perhaps even contentious), that doesn’t necessarily mean that they have failed. Cate’s presentation in five acts with the live twitter stream behind her was entertaining and thought provoking: asking us to consider how we might perform our academic identities with instead of for, blurring that line between writer, text, performer and audience, creating a “theater without spectators.” Widner had planned a twitter zombie game, but his repeated testing of the program earlier that morning ended up locking him out by the time the conference started. Instead he walked us through the code, explaining the few categories necessary to create a social game and the beauty of writing code for both machines and humans to read. Coding as creative writing. In session C6, Jason Palmeri and Ben McCorkle presented their preliminary data for Multimedia and the Teaching of English, 1912-1970: A Distant Reading of English Journal which I was very excited about because I’m doing something similar for my first year exam. They were absolutely delightful to watch and the various ways that they coded and represented data were really helpful to see. I left the presentation with a dozen ideas for my own project, but I wish I was working with a partner because I’m a little discouraged by the sheer amount of work that coding all the articles can be. They were investigating the representations of multimedia assignments in English Journal prior to the digital age, identifying trends that closely link historical events and technological advances with classroom practice. Kyle Stedman, Bill Wolff, and Tekla Hawkins dove into remix, twitter, fanfiction and theories of composition and community in K1, which was well attended and heavily tweeted even though it was in the last time slot of the conference. You can watch video of it here. Stedman’s presentation was especially novel. He played short audio clips and explained the phenomenological contributions of sound to composition (and confounded the room by pointing out that lasers don’t make the expected swishing or pinging sound that science fiction movies have led us to expect). Bill Wolff examined the twitter community of Bruce Springsteen fans and asked “What are tweeters doing?” He identified practices that historicize, notify, and perpetuate community norms and information as well instances that build intertextual communications. Tekla Hawkins suggested that the increasing popularity of fanfiction demands the need for closer attention from academics and that fan compositions work as a remix practice, drawing from the canon as a database and creating something new. I liked several things about Gee’s keynote, specifically that he pointed out that while we are talking out of one side of our mouths about the importance of education for employment, we are ignoring the realities of employment and income inequity in America. The sorting function of the American education system is made to level children, and as students’ skills increase, the leveling mechanisms adapt. There will always be a top 10%. There will always be a bottom quartile. We measure people and imply that if they aren’t measuring up, they are at fault, which is disingenuous when we routinely change the measures to make sure that there is a distribution. I think he’s right that we seriously need to rethink the structure, purpose, and promises of education. I take a tiny bit of issue with his notion that “games talk back” in ways that texts don’t. There is, of course, an interactive element to games, but they are still scripted and limited, with edges defined by the “text’ of the game, the imagination of the game-maker. Still, I suppose they give you a more embodied experience than traditional text. I’m revising my review for Sweetland, and I’ll link to it once it’s posted. Remembering that everything we do online is supported by commands written in text seems like an important starting place for people who want to think about what it means to be a digital writer. I bought a Unix guide for OS X. I’ll let y’all know how it goes. 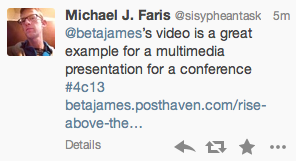 I thought the quality and variety of presentations was impressive. I appreciated the opportunity to talk with people whose work I had read and admired and found the faculty in attendance really committed to mentoring new people in. 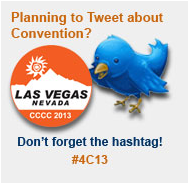 I had great conversations with people at every turn, especially about pop culture and fan culture communities online. I’ve had no formal training in digital publishing or coding, but I’ve been participating in fan communities and trying to make blogs on various platforms do what I want for ten years now, so I’m fairly well-situated to follow those conversations, and I really, really want to know more. I feel like #cwcon was a place for me to watch other people think through the digital marvels of everyday life, and I hope I have something ready in time to submit for next year. I’m currently working on a First Year Exam (FYE) about representations of multimodal and multimedia assignments in NCTE journals, and I haven’t quite nailed down the “question” yet. I’ve met with my two readers to set up goals and timelines, and so, in twelve days, I have to have SOMETHING to give them. You see, I’m trying to map my progress and make the connections manifest in a way that will help me structure my final draft. 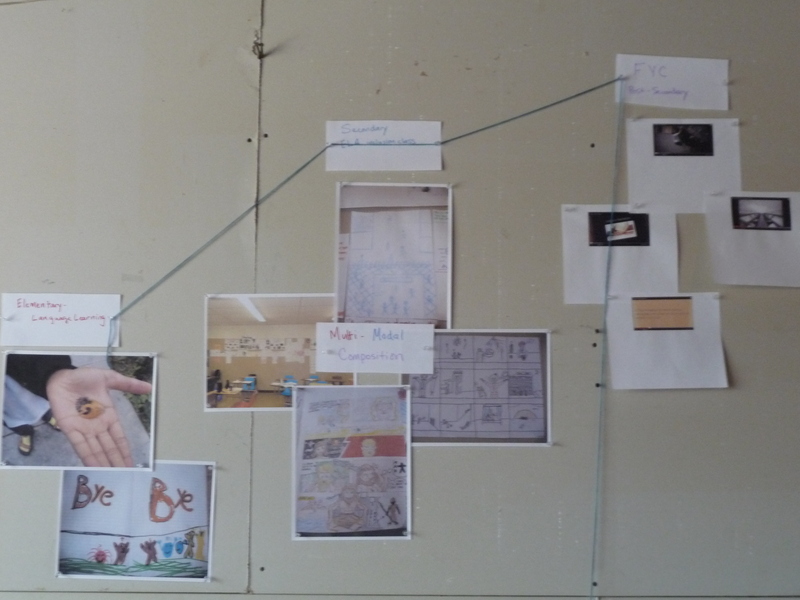 I’m illustrating the parts with images, the connections with string, and the categories, or meta with text on index cards. I’m taking photographs when I make changes and filming the process in hopes of creating a time-lapse video representation of my thought process. For my own entertainment. I am hoping to get some use out of the process though. I’m hoping that the physical/visual representation of my work will improve the clarity of my prose when it comes time to articulate the connections between the different parts. I’m planning to make a webtext in Dreamweaver alongside my FYE text, and I’m hoping that this large-scale concept map will help me understand the best way to link the parts and convey my ideas about the connectedness of terms like “multimodal” and “multimedia” to each other and to classroom practices. My biggest problem (always) is narrowing, and I’m expecting this process to be useful for that as well. Maybe with a large-scale reminder that I have left some interesting pieces for another time, I can actually let myself let go of them and focus on something more appropriate to the task demands of the FYE. So, I don’t know whether string is going to help me do all these things or not, but I like the experience of engaging with my thinking in this way, so I’m going to lean on it for a bit longer and see what comes of it. 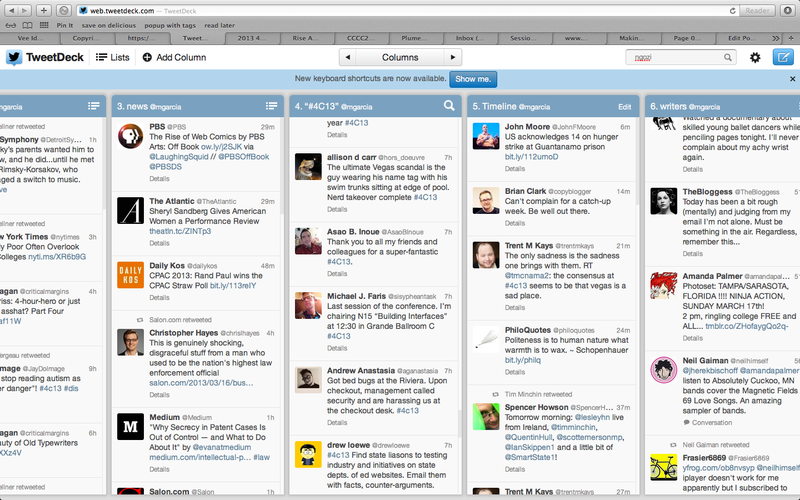 I’m also keeping track of articles in my mind palace (which is under construction – always). I need to rework the annotations for the 16 English Journal articles I’ve read before they can go up, and I plan to revisit readings from last semester’s Computers and Writing class to add to the record. I had originally envisioned the repository as a spreadsheet, but I like the idea of using tags and making the information more broadly available – even if I’m the only one using it. This issue of Kairos is all about multimodality, so no doubt sharper (and quicker) minds have already published what I had in mind. It’s exasperating when reading around unearths work that got to your ideas first, but also very necessary to acknowledge it (and maybe also to acknowledge that being first doesn’t have to be the most important thing about your work). So, I’ll be reading (and annotating for the mind palace) articles from the most recent Kairos and a webtext that they published in the fall by Claire Lauer about the terms multimedia/multimodal/digital/new media. Hopefully the pieces will help me narrow. I was recently reminded of a chapter by Tara McPherson in The New Media Book called “Self, Other, and Electronic Media” by an ad campaign targeted at children who are suffering from abuse at the hands of adults. McPherson describes the complexities of race representation in new media by comparing it to an older visual technology: lenticular lenses. Lenticular technology interlaced two images in such a way that when viewed through a special lens, only one image could be viewed at a time, depending on the physical position of the viewer and the image surface. The two images coexisted, but their relationship to each other was obscured. McPherson argues that this repression of relationality between the two images exemplifies the problem of constituting the self and the other as if they were not related and reflects similar difficulties in new media spaces where people may work with fragments of representation or code which obscure relationships with the larger social world. People in the comments have raised the predictable concerns: short parents, tall children, children of the expected size being unable to read or without access to a phone, the psychological constraints that prevent children from reporting, the problem of parents and children seeing different messages. This last issue seems to most nearly echo the concerns that McPherson raises in her chapter. The conversation (or lack of conversation) that the ad might provoke between adult and child will rest on the premise that they observe different realities and take away different messages from them. 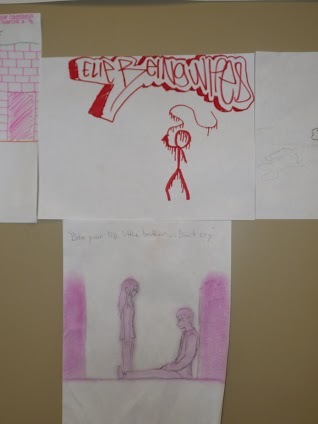 The repressed relationship here is not so much between the two images, which can coexist, but not co-appear, but between the two viewers, the adult and the child, who coexist and co-appear in a reality that relays different messages and attempts to obscure the mechanism by which it does so. What happens when what an adult sees and what a child sees differ? How is the difference accounted for? How is the (child) self constituted in relation to the (adult) other, and vice versa? Do children and adults live in different worlds? How do we deal with lenticular realities? The visual drama of the advertisement highlights the social drama of situations where children and the adults responsible for them are not necessarily on the same team. McPherson concludes that “[her] argument builds to a warning, a cautionary tale about the multiple modes of meaning a coded fragmentation can create” (191). Will coded messages improve the lives of children in desperate situations? Whether the ad accomplishes its stated goal or not, it has certainly brought attention to the possibilities and problems of constituting adults and children as inhabitants of unrelated realities. 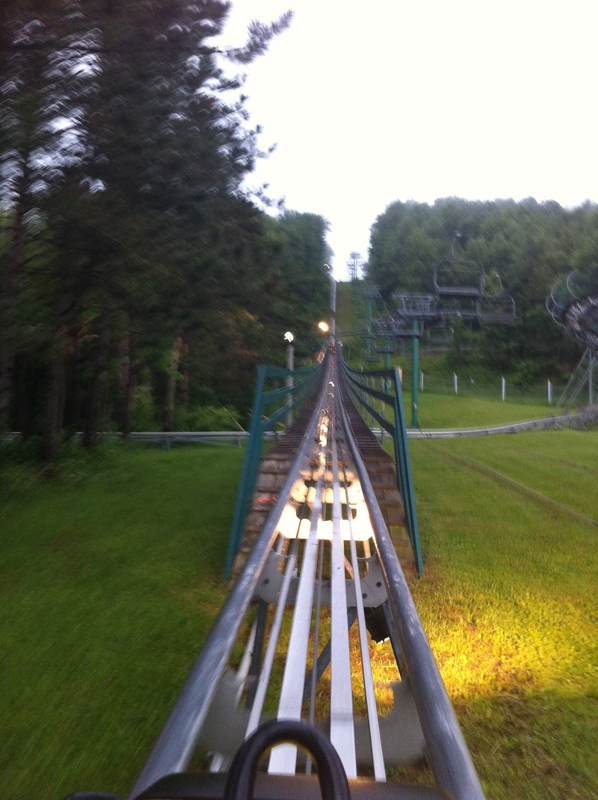 Note to readers: Apologies for the way wordpress may warp the text to accommodate pictures. I’m working on it. (In full screen it’s okay, still not great.) Please comment or message me if you have suggestions! We’ve been thinking together about multimodal composition in a “Computers and Writing” class that I’m taking this semester, especially about how digital composing might be similar to and separate from other kinds of multimodal projects. It seems especially important to think about in terms of what we mean when we say that we integrate technology (use) in the classroom. I think true integration includes some aspect of creation/production on the part of the student. Over the years, I’ve tried multiple strategies for drawing students into participation with literature, multimodal composing, and technology with mixed success. I’ve had class blogs and wikis, used learning management systems (like moodle and ctools), made comments and held conferences (both synchronously and asynchronously) through google docs, assigned multi-genre projects, designed displays of student work at varying levels of publicity, and encouraged the production of comix and video. It’s been messy and fun and frustrating. It’s a lot of work, and I kind of love it. 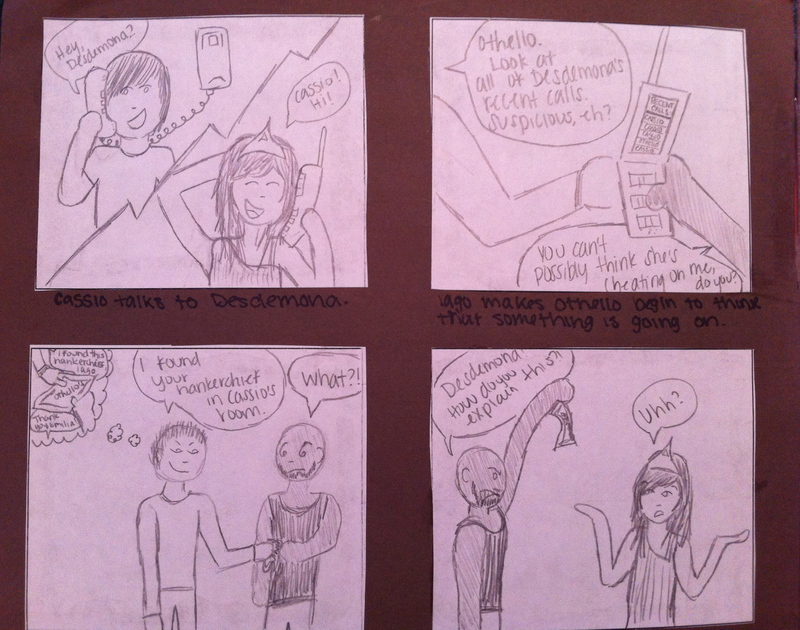 I thought I’d share a bit of my students’ work here and think through what these multimodal assignments offered. 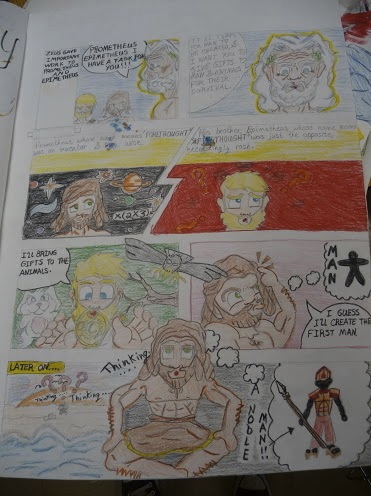 For this assignment, students worked in groups to “translate” a myth (the myths were chosen from various cultures) into comix format. They identified the major plot points, divided dialogue and description, modernized the language, and balanced image and text to convey the story. Willie Houston (10th grade) was the lead artist for this group and worked several hours after school and during lunch to complete this project. I especially like the”thinking” backgrounds behind Promethius and Epimethius. 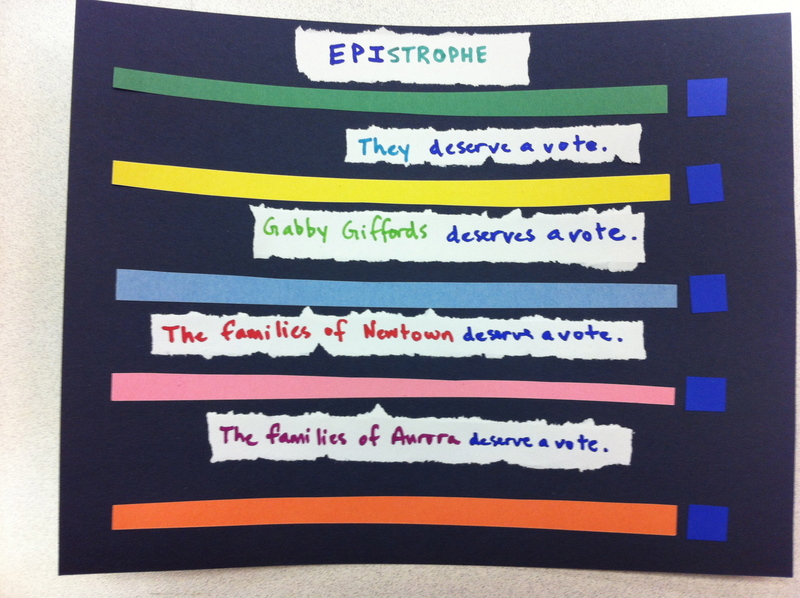 After this project, students wrote their own originary myths – explaining how the world or something in it came to be. 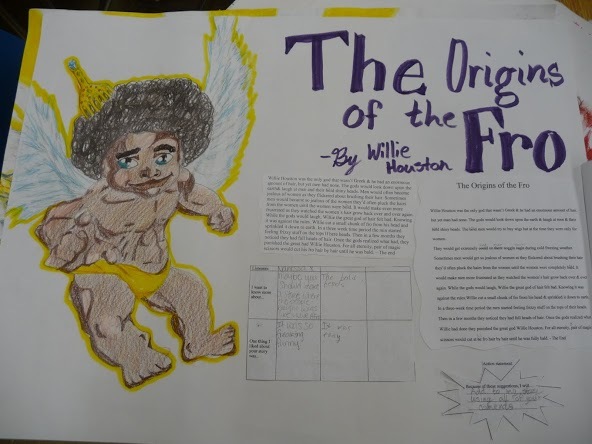 Playing on Promethius’s sacrifice, Willie wrote “The Origin of the Fro,” in which the protagonist suffers his hair being snipped away every night so that mankind might enjoy glorious hair. You can see his rough draft, peer comments, plans for revision (in the starburst), final copy, and illustration. 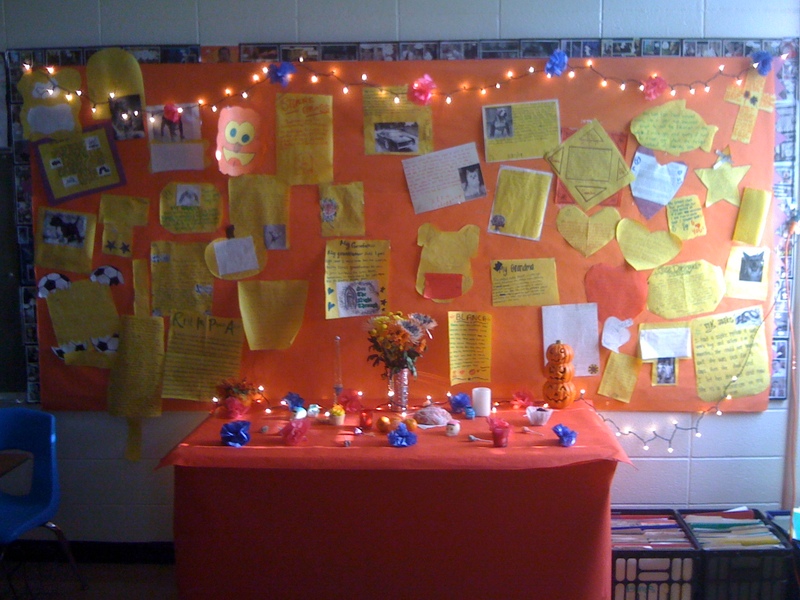 Around Dia de los Muertos, students wrote a short memorial and copied it onto yellow, orange, or red paper for a class offrenda. The memorials were about cousins killed in Iraq, grandparents left behind in Mexico, beloved pets, or if someone was lucky enough not to have lost anyone yet, celebrities. 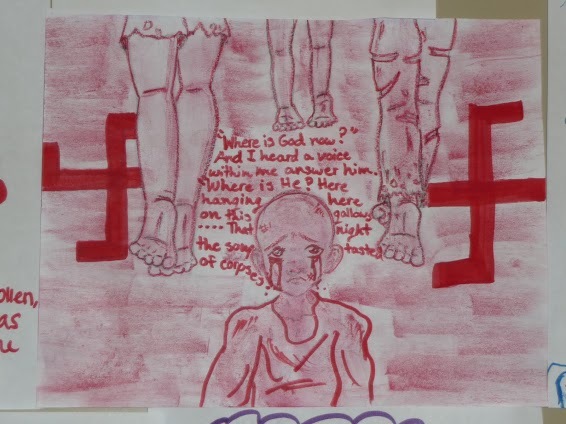 Some of my students worked harder and more thoughtfully on these pieces than anything else they did, and it prepared them to read or reflect on (depending on whether we read it before or after) Antigone and her struggle to honor her brother. We lit candles, read Aztec myths about monarchs carrying the souls of the dead, and had cocoa and pan de muertes on the final day of the unit. 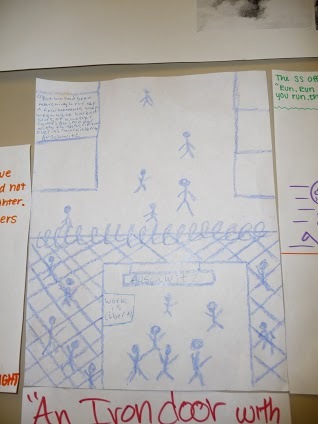 In this project, I asked students to choose one memorable moment from Night by Elie Wiesel, choose one color, and illustrate it. When they were finished, I put the illustrations in order as a kind of review for the events of the novel. A few moments have only one illustration, but some of the more traumatic/emotional got multiple illustrations, reflecting their importance in the memoir. I read Night aloud every Spring for six years to multiple classes. 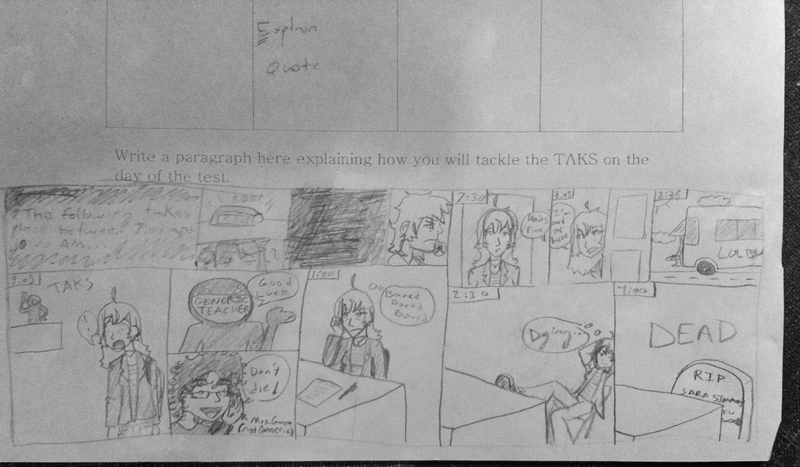 These lessons were part of my TAKS preparation unit. 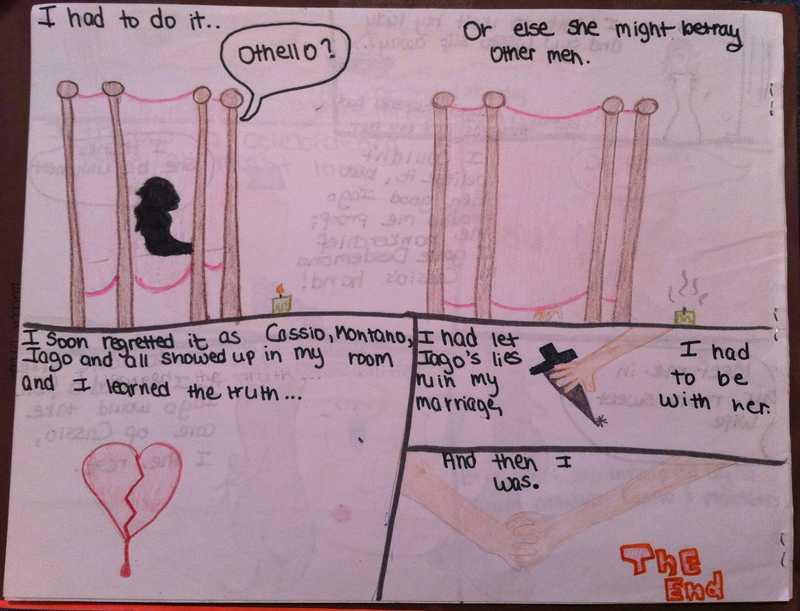 After testing, we typically did a Shakespeare unit, and students had the option of making a poster/comic or adapting and filming a scene. By this time they had done both and had a better feel for where their talents could be best put to use. I love this final page in Stephanie Perez’s Othello. The silhouette of Desdemona waiting, the image of the candle put out (that’s a reference to the source material), the broken and bleeding heart, and the joined hands at the end capture very well the mix of sorrow, finality, and forgiveness at the end of the play. In Traci Partida’s work, the damning evidence comes from Desdemona’s cell phone record, though the handkerchief, and Desdemona’s inability to account for it, is still the final straw. So I have plenty of “composing” going on, great thinking, interesting conversations, but a legitimate question remains: where’s the writing? I believe this kind of work promotes deep engagement and familiarity with texts, community in the classroom, and appreciation of the varied experiences and talents of the students, but can it count as writing? These activities were not the only things we did in class, but I gave them a great deal of time, and I insisted that we read these works aloud together to model my own comprehension strategies and to be sure we all had the opportunity to contribute. By the end of the year, students were fluent in the two page personal reflection essay required for the state exam and well-prepared to tackle the open-ended response questions that required using evidence from the text to make a point. Though I felt pressure to prepare them for those tasks, I also believed that these multimodal projects had the power to get them there. Students had an opportunity to see their thinking embodied in the classroom. They looked at each others’ work with a critical eye and commented on what worked and why. Did these skills transfer to their later reading and writing tasks? It occurs to me that a great deal of what I was aiming for with these assignments was building “common” knowledge. 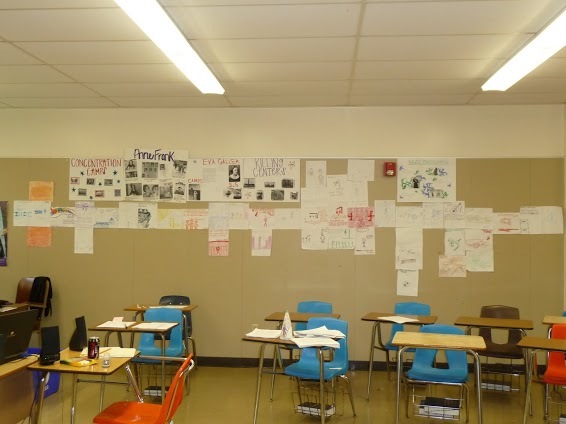 The potential for display and quick uptake of these projects meant that students often walked around the classroom before and after (and sometimes during) class, taking in what their peers had made of the works we were reading together. So as I revise and research to adapt this piece for my scholarly webtext, maybe I should be looking for the ways in which multimodal projects contribute to community and classroom knowledge. So here’s a video I made in case you are using WordPress Reader to follow the class blogs. It is less than a minute and a half, and it will show you how to add non-wordpress RSS feeds to your WordPress Reader. It was easy and fun to make. Let me know if it actually helps. I’m interested in how people make these kinds of videos for “flipped” classrooms, and what that might look like in ELA classrooms. I like the idea of being on hand to help students work through their practice/implementation of what they learn in class, but I spent a good deal of time altering what I did in class in response to what students did/did not understand about the literary texts that we read, and I’m not sure that we wouldn’t lose something important by relegating instruction to a pre-recorded lecture. Something about the immediacy of ideas, maybe? Or maybe all that time I spent reading aloud to my classes could simply be podcasted or posted to youtube, and we could have class discussions that went beyond getting through the text together.